Great Britain 1930's has had a constitutional crisis - Edward won't abdicate following his marriage to the divorcee Wallis Simpson. The Government of the day cant stand idly by and resigns on mass, the leader of the opposition refuses to form a government. With no government in place Edward uses his royal right to ask the fascist Oswald Mosley to form a government. Believe it or not this could happen ! Clearly the electorate disenfranchised by their politicians feel aggrieved and many take things into their hands - motivated by political leanings communism, socialism, capitalism etc etc several splinter groups take advantage of the political vacuum. The beauty of this period is that players are encouraged to write their own local histories and fight the ficticious battles in the areas they know. With the timing centred on the mid thirties we are beginning to see the mix of the old great war technologies with the new. Its going to be great fun! 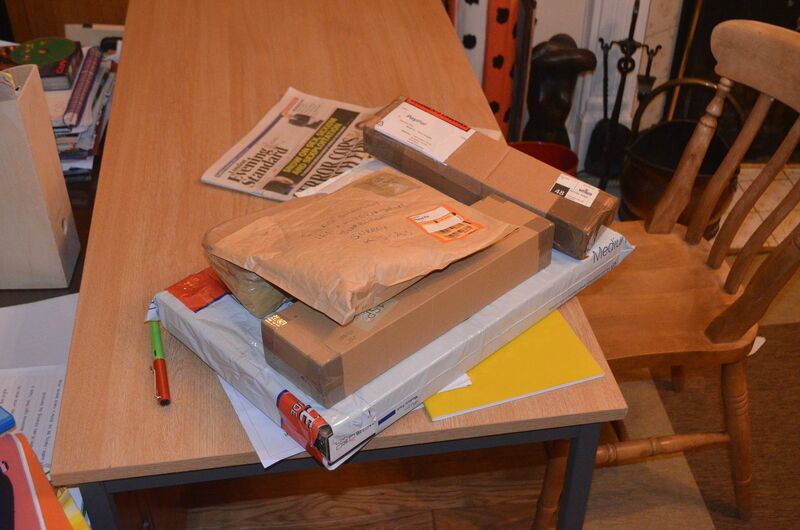 So I get home today and a big pile of parcels await...plus more tomorrow! 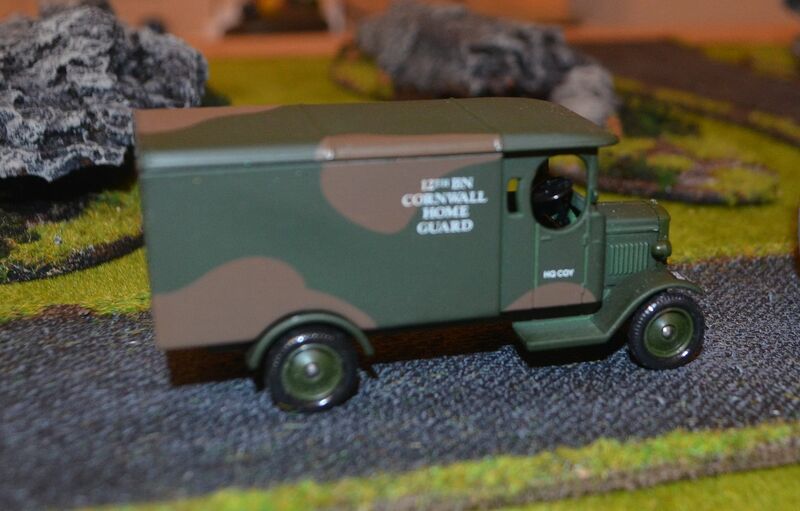 Having decided to tackle this head on I spent a few quid over the weekend scouring for troops, vehicles and other interesting bits...this post focuses on the Vehicles bought. 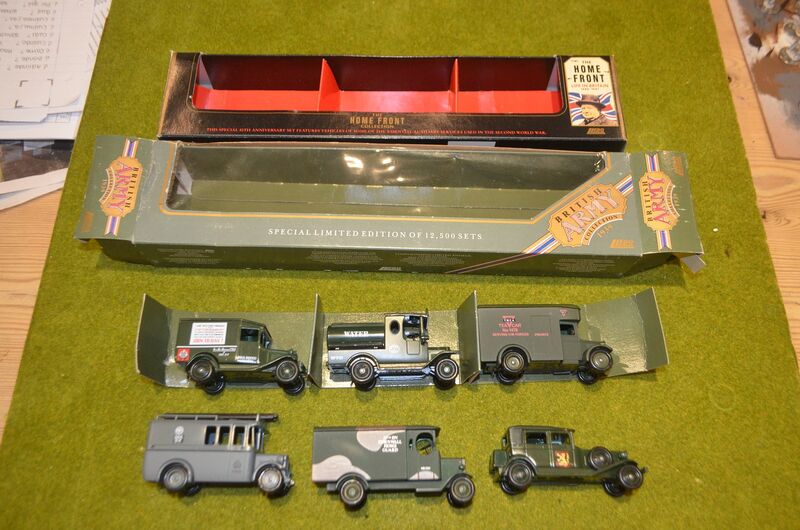 They are all from the Lledo range and given these were no longer in production were all sourced on ebay. 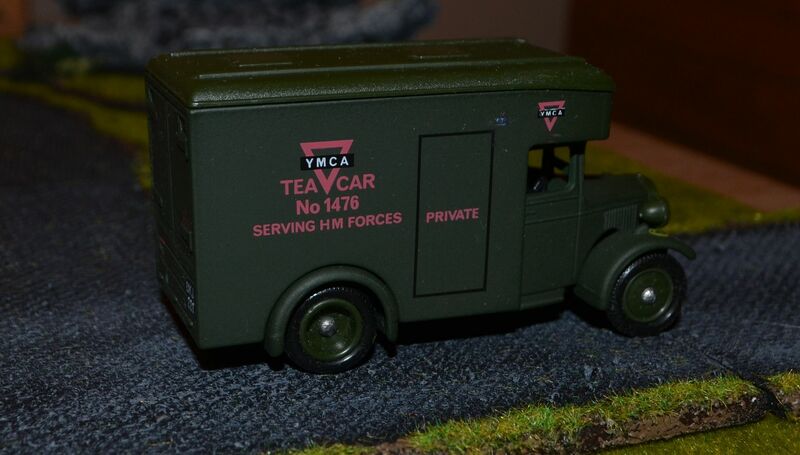 A few months back I bought some civilian cars but they've gone missing in the shed but once found I'll post them up. 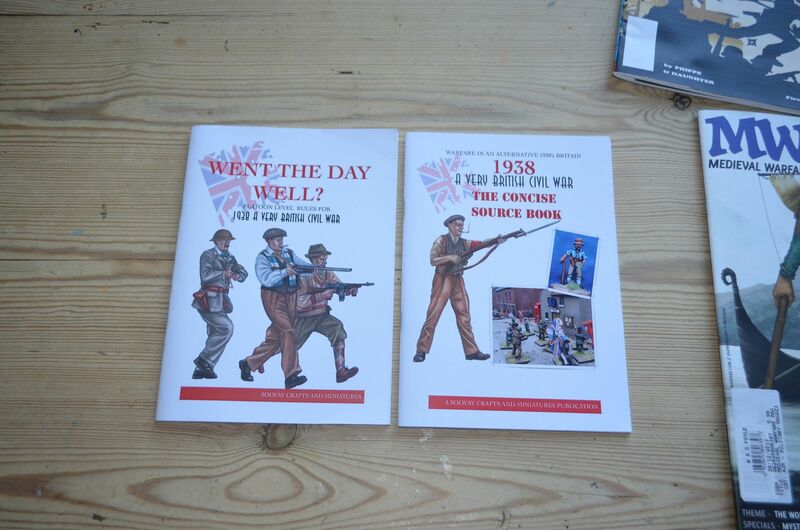 I was very fortunate to find two perfect box sets - the first a limited edition of the Home war Vehicle range, the second being a second world war range. These are both perfect and as you can see are very close in scale to the 28mm figures - the figure shown is a British Fascist from Gripping Beast (Musketeer range). 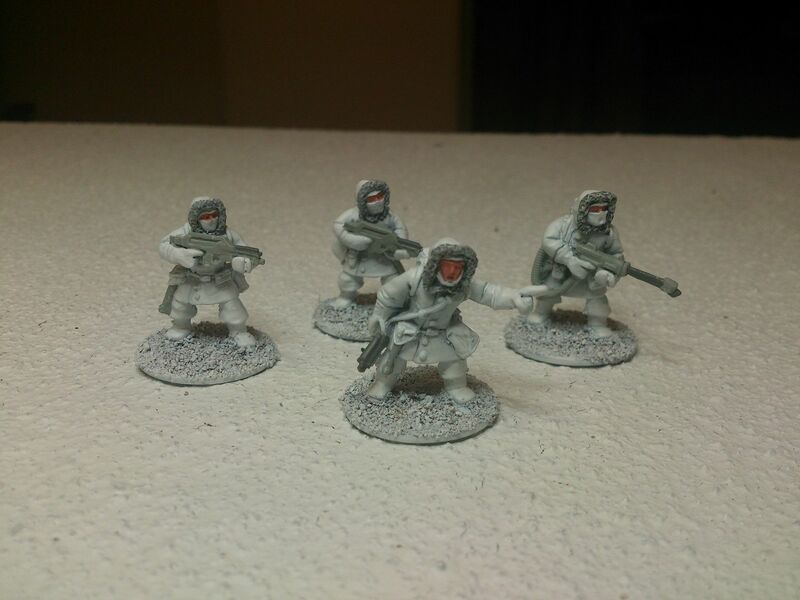 Over the coming weeks I'll share my thoughts on the figures I have bought -and the factions I am painting. I also have a whole new terrain project to build - a railway line complete with trains, bridges and tunnels for southern England. The first elements have arrived but these can wait for a future post. 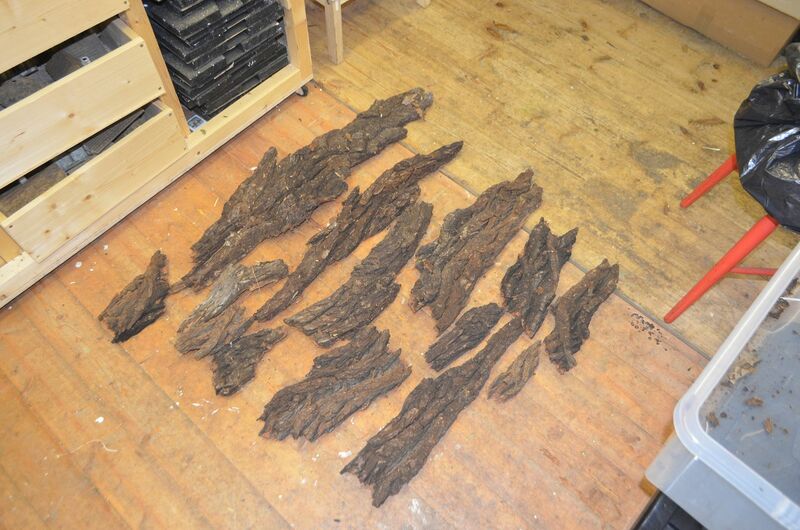 Remember all the bark I collected in a local park? 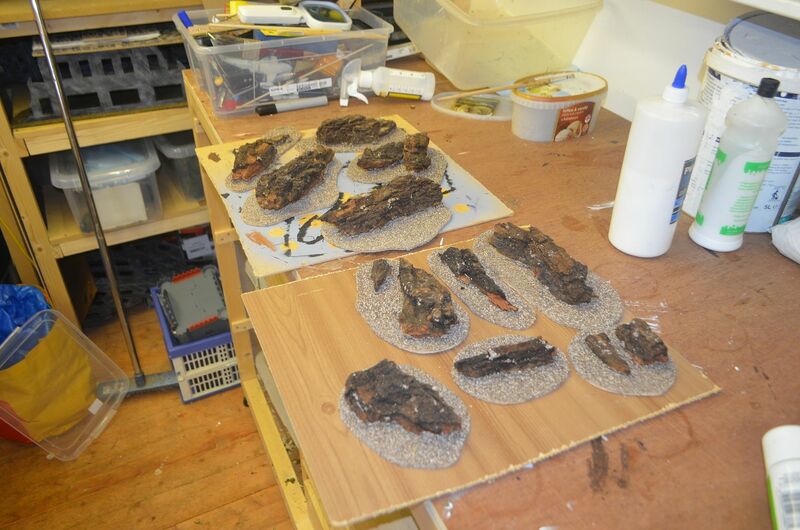 First up I broke the bark into smaller pieces and these were stuck down to hardboard bases. 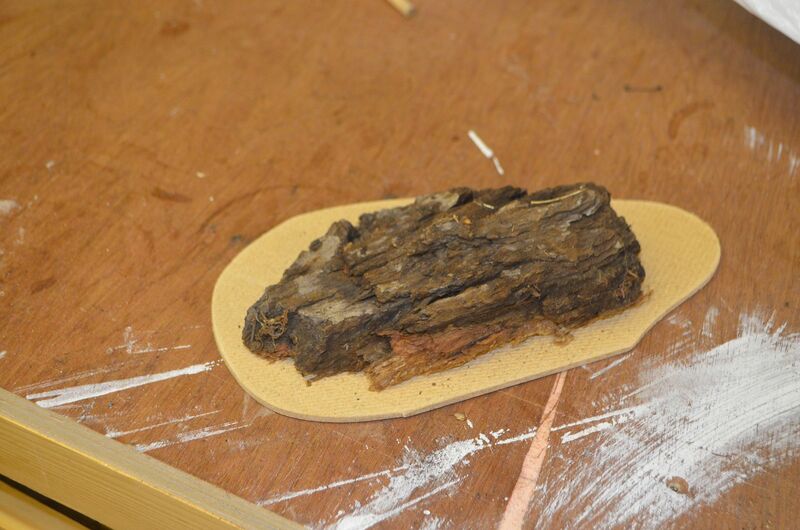 Once dry the pieces were then given a zap in the microwave to make sure any lice or other wood eating bugs got toasted. 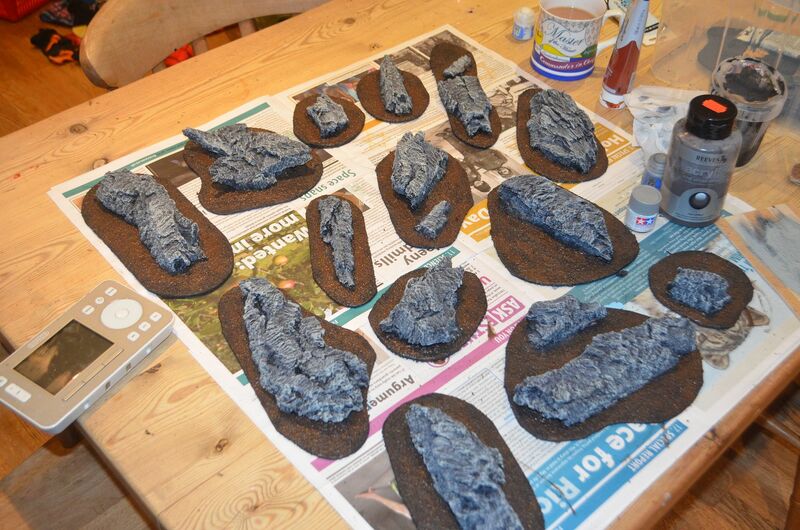 With the 'rocks' dry and glued I covered the rest of the base in ballast and grit. 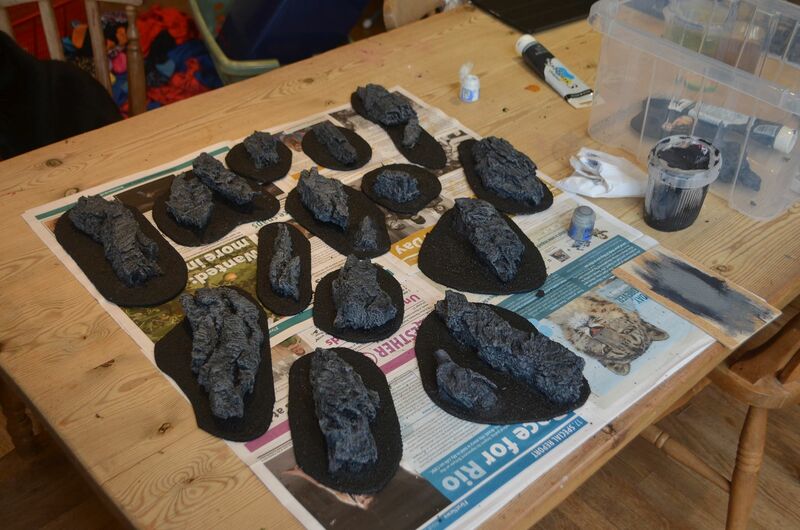 These were glued down using PVA and left for 48 hours to dry. With the excess shaken off all the units will next be painted black. I have done about 18 so far with 11 shown below. 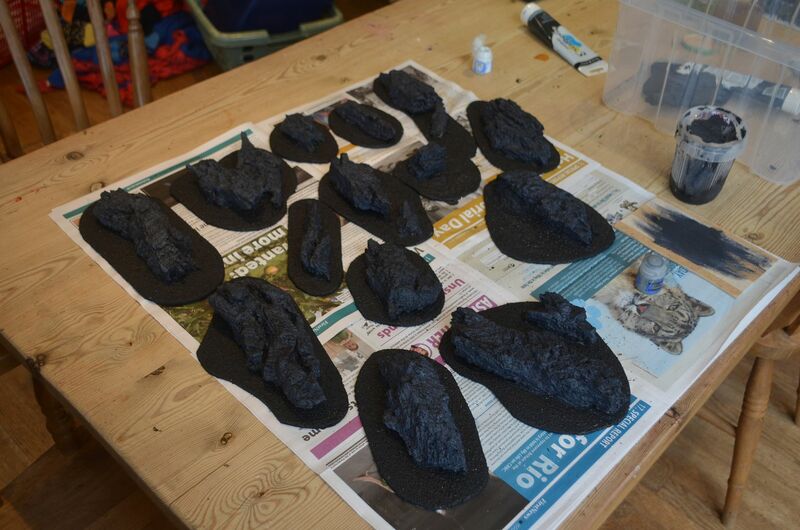 Ok - so with the weather closing in I decamped to the Kitchen where all the bases and rocks were given a good coat of black acrylic paint. Twenty four hours later I was able to start the fun bit. 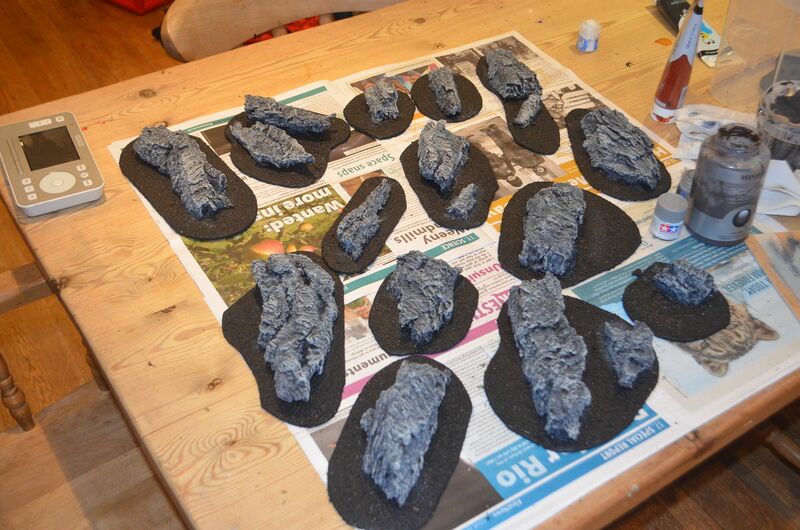 I firstly dry brushed the rocks in a series of three greys from dark to light. 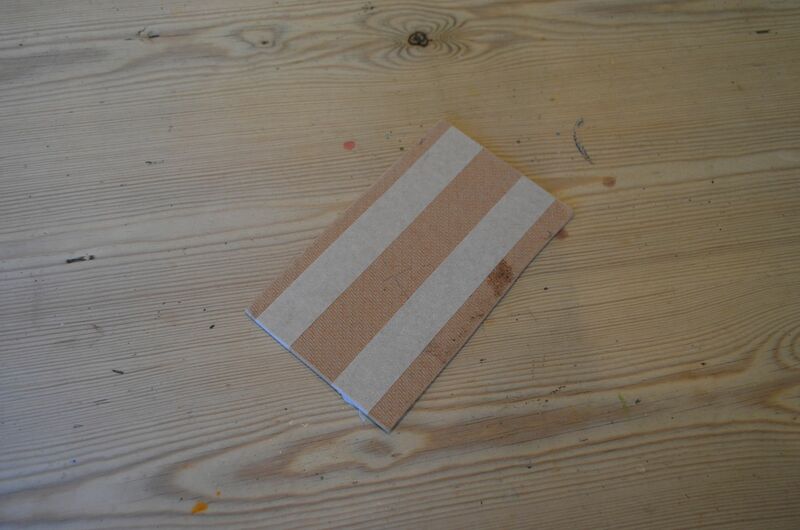 This is really simple and takes no time at all between coats. The fact that I am running a production line on these means by the time I get to the last the first is ready for its second coat. 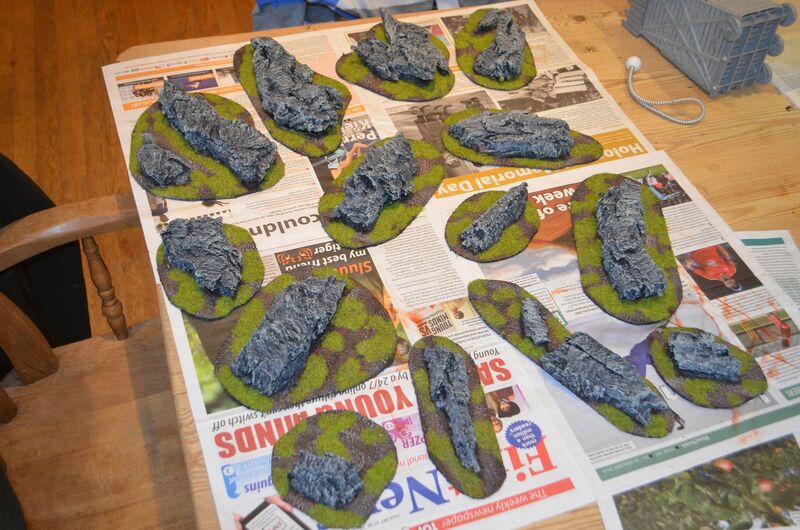 Only once the rocks are completed do I attack the base. First up a heavy dr brush of dark brown, followed by a burnt sienna. 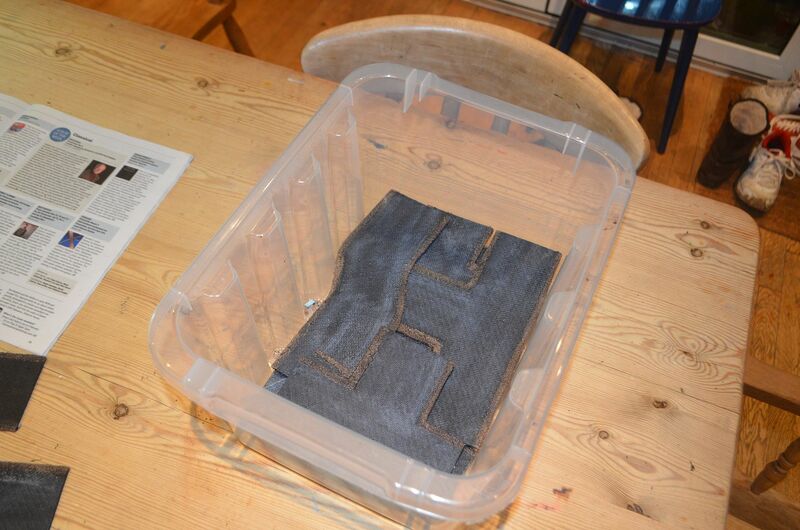 The picture below shows the last grey coat and the first coat of dark brown. Finally a quick drybrush of cream onto the brown base. 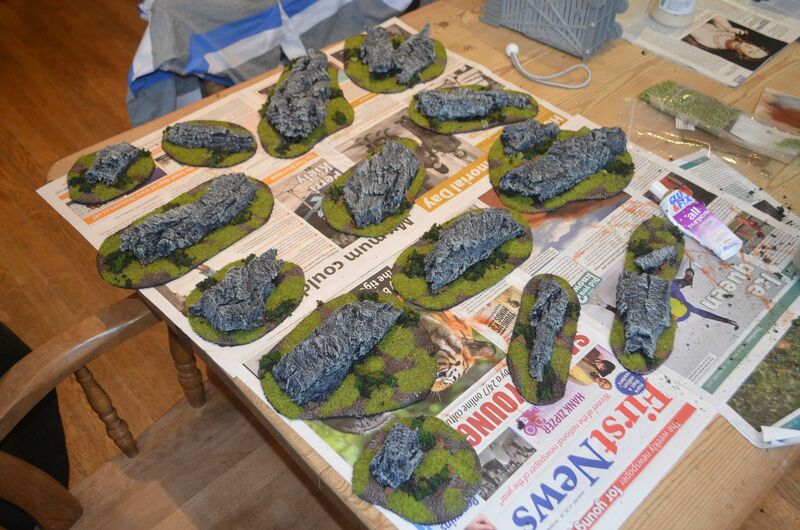 Followed by some clump foliage fixed with an all purpose clear drying glue from bostik. It seems only fair to show some in scene photos. The first two are of the highland cattle bought from Redoubt miniatures. 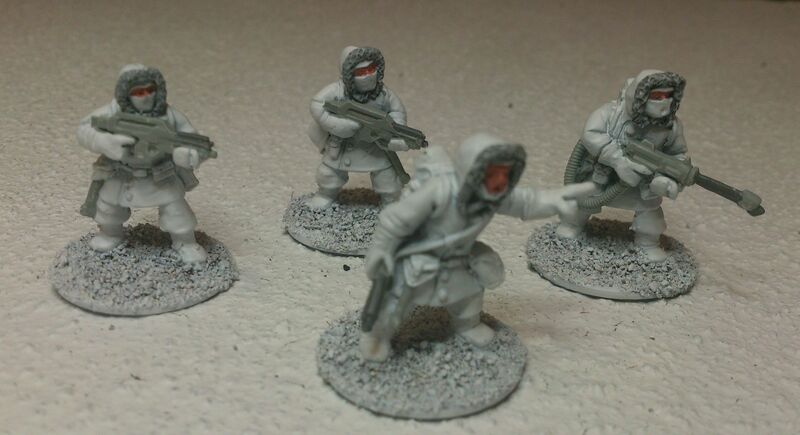 These will be a worthy prize in a forthcoming saga game. 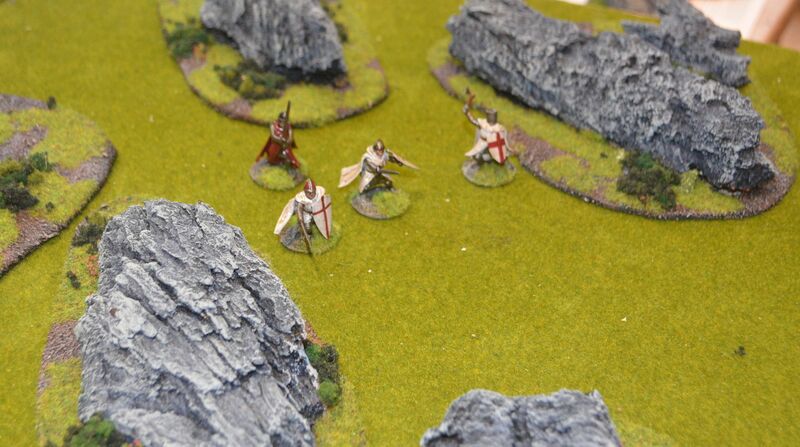 The second set of photos are some Crusaders from the Fireforge range - (28mm) if only to show you the scale of these rocks. 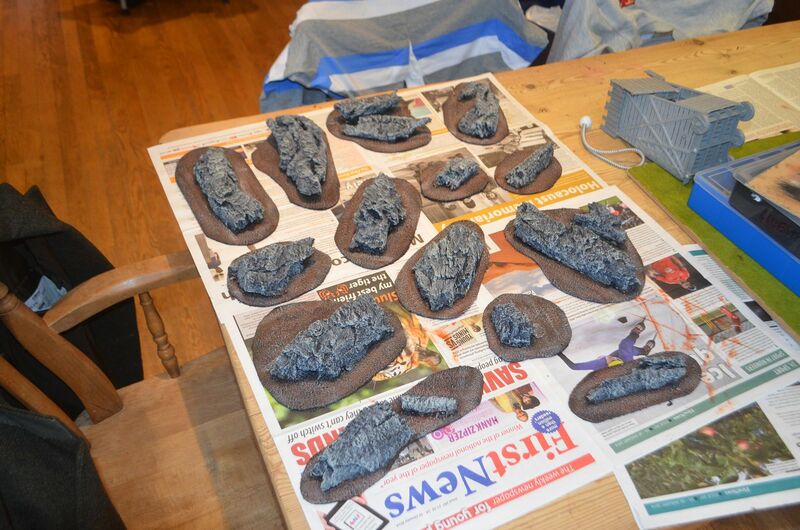 If you enjoyed this tutorial you might want to look at my attempt at making cliffs constructed from cork bark. When I left you earlier this week I'd just finished dry brushing the grey onto the road surface. 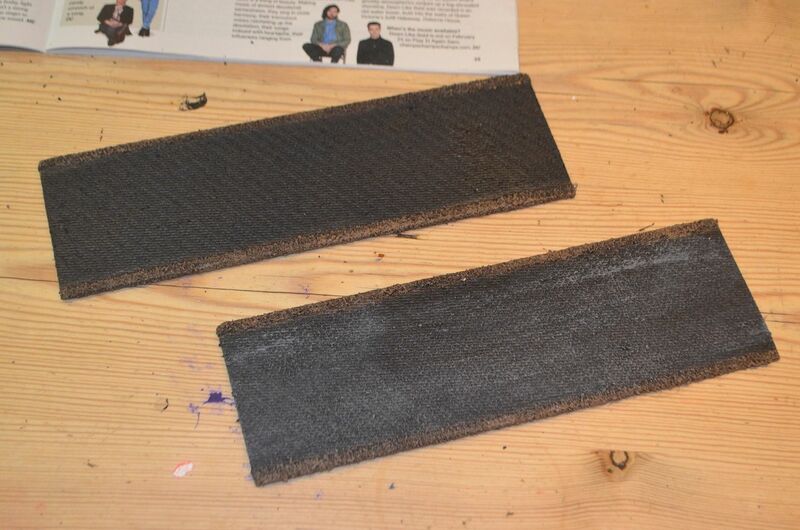 Nothing too drastic but it does bring the bits to life and as you can see the grey brush lifts out the road surface. I still need to do some weathering to the surfaces but we are getting there. 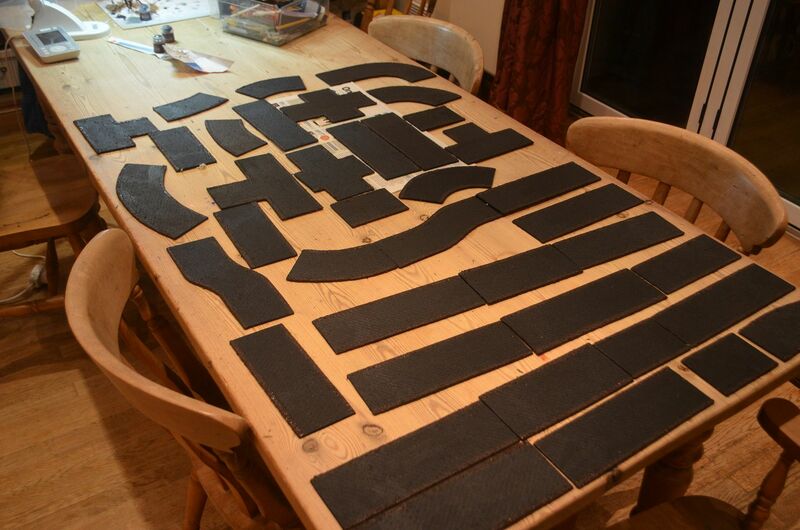 I then took the opportunity to lay out all the pieces to see how much I had actually made...I am quite pleased. 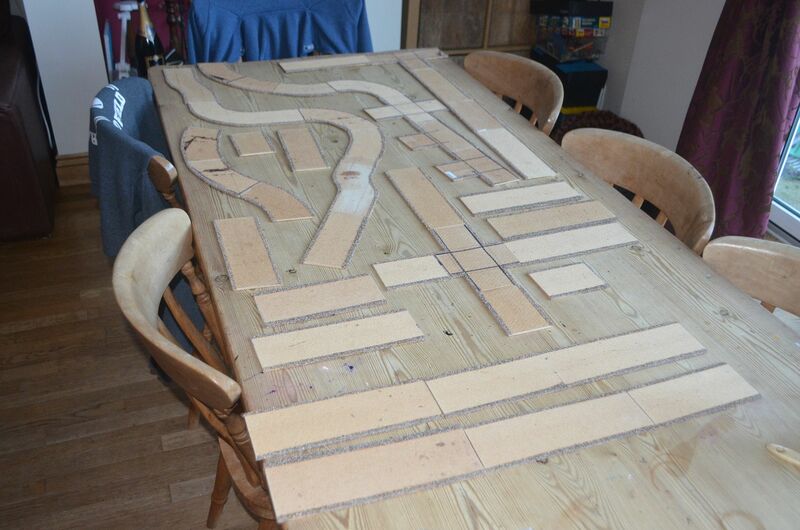 With a bit of luck I'll get into the shed at weekend and lay out the roads completed on the table for a proper photo shoot. 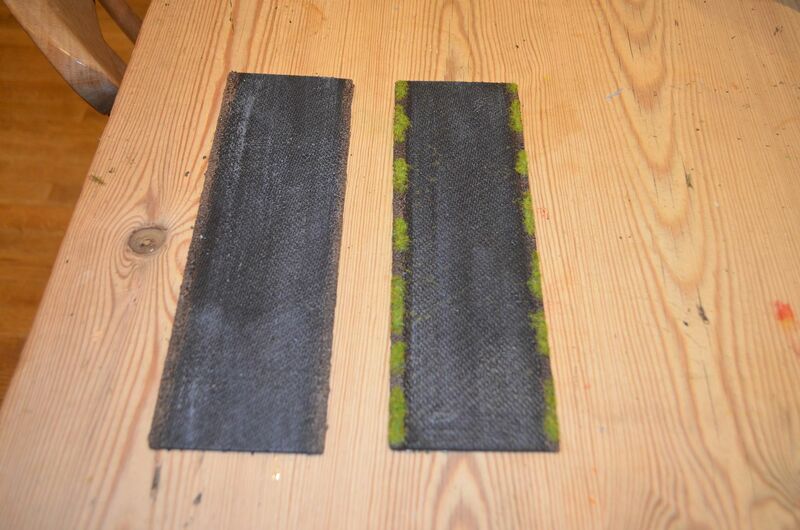 So with an ambition to do Pulp and VBCW wargames I realised I would need some asphalt roads. These are dead easy to make. 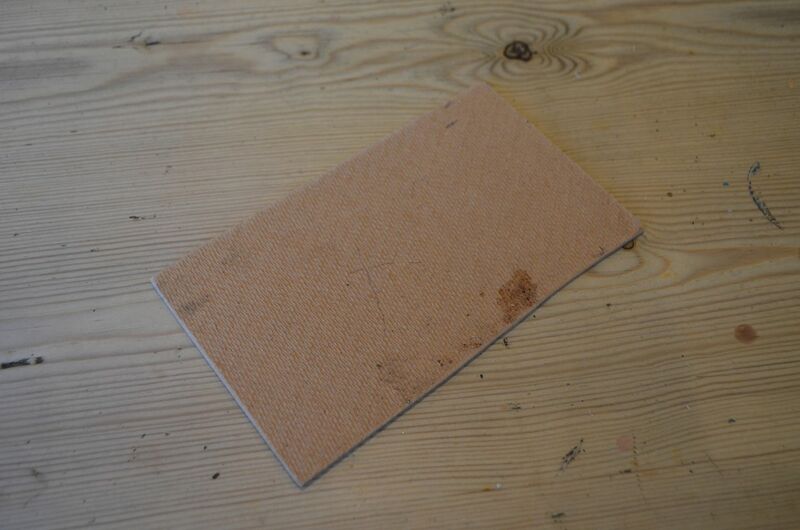 In terms of the base material I settled on my favourite - hardboard. 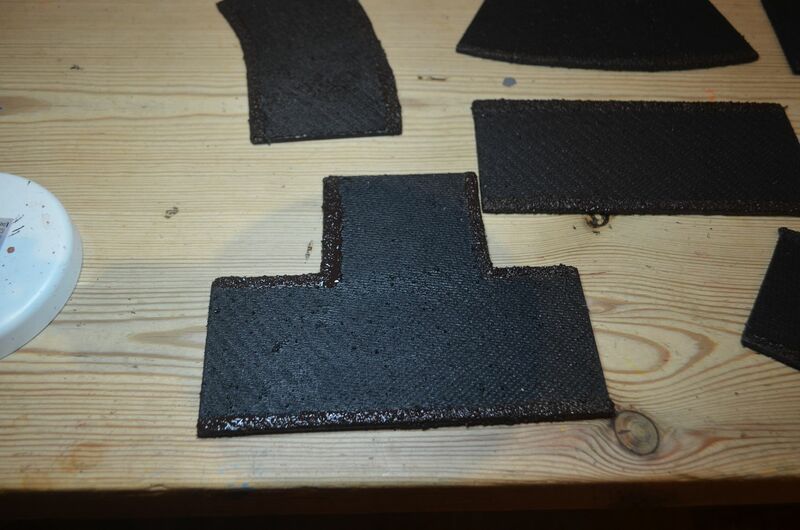 The great thing about this material is that one ride is quite rough and when painted up doies give a road like surface. You can just about make out the pattern in the photo below. 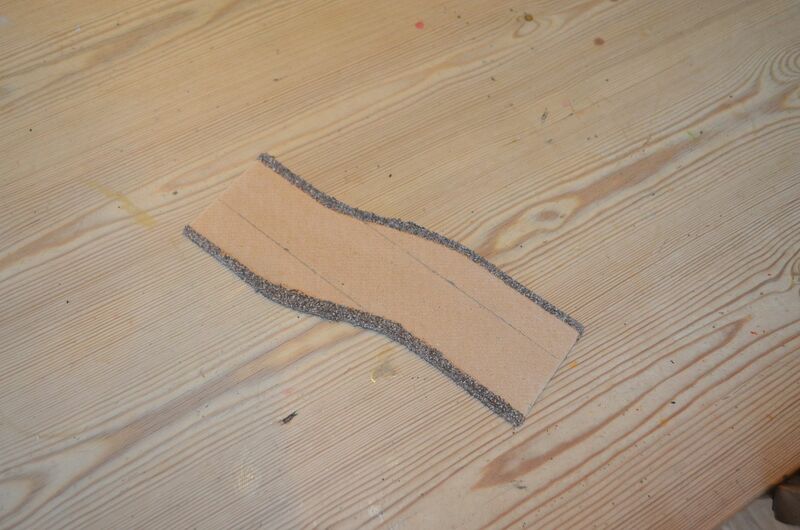 I cut out with a jig saw several length, including corners, bends, t junctions, and crossroads. 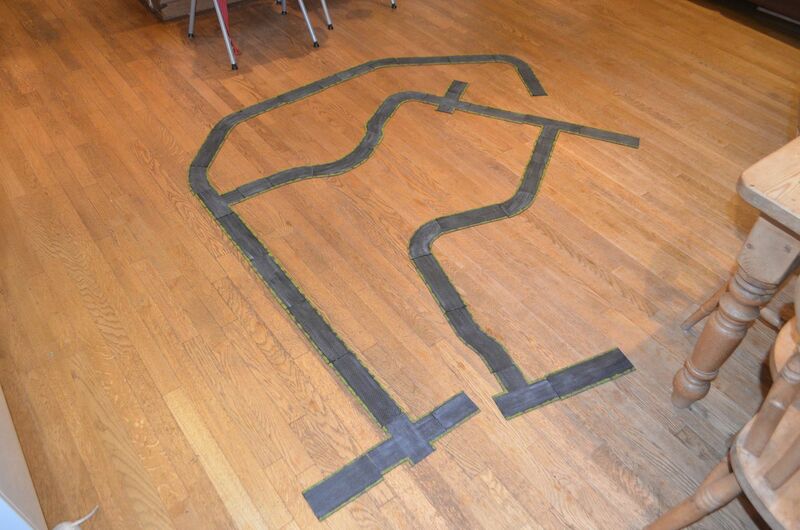 To create the raised curb edge I masked off the road edge with masking tape. Next up is a good coat of black acrylic paint. The curbside edge then got highlighted with another lighter brown and the road surface itself highlighted with dark grey. 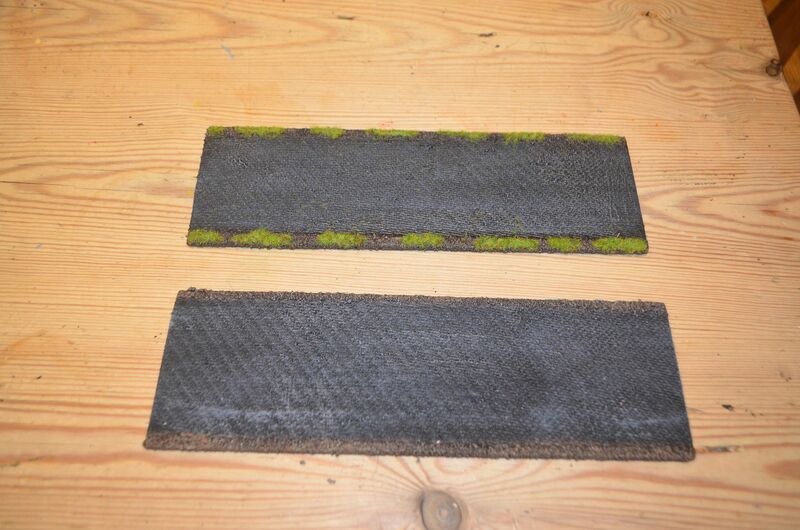 The photo below illustrates the before and after the grey on the road surface. In the next stage I need to grass up the verges and I'll show the roads off in their full glory. So 2014 has started in earnest and as a result I have been casting around for the next set of adventures IO want to play. 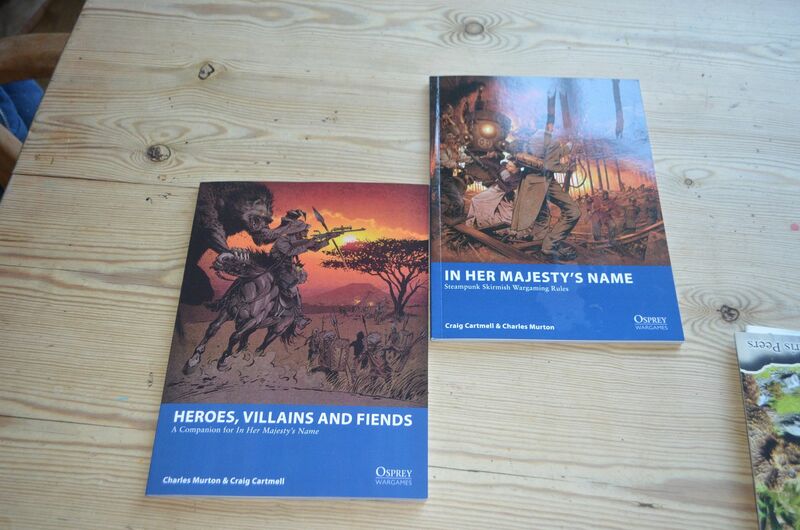 Aside from the Polar adventures I have long wanted to play some Pulp games and get involved in the Very British Civil War. 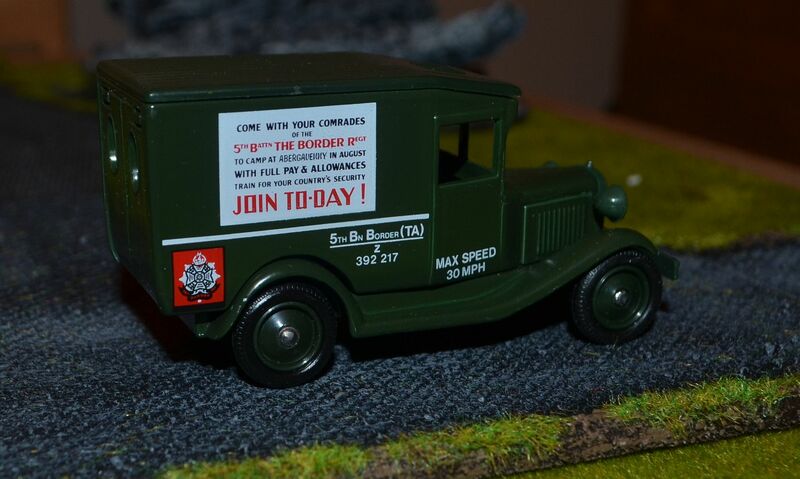 The great thing about focussing on the latter two is that from a period point of view they are both set in the 20's and 30's so common sets of terrain and figures can be employed. 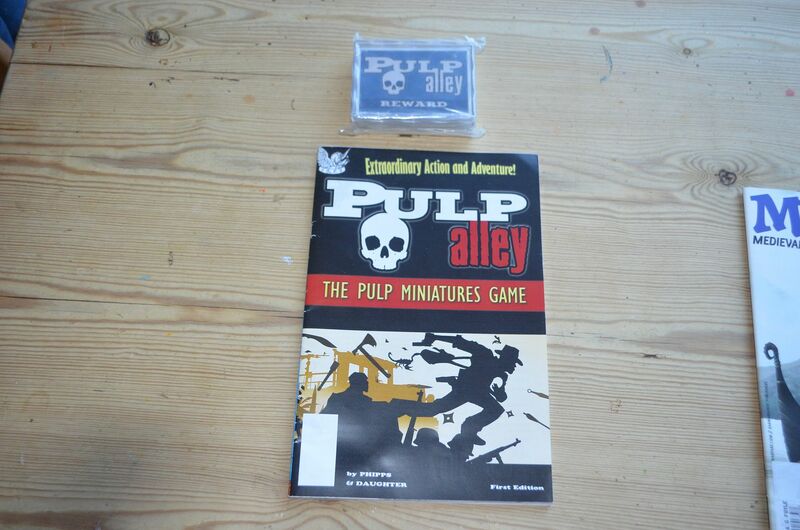 Having seen that Pulp Alley has its fair share of advocates I decided to go ahead and buy the rules. 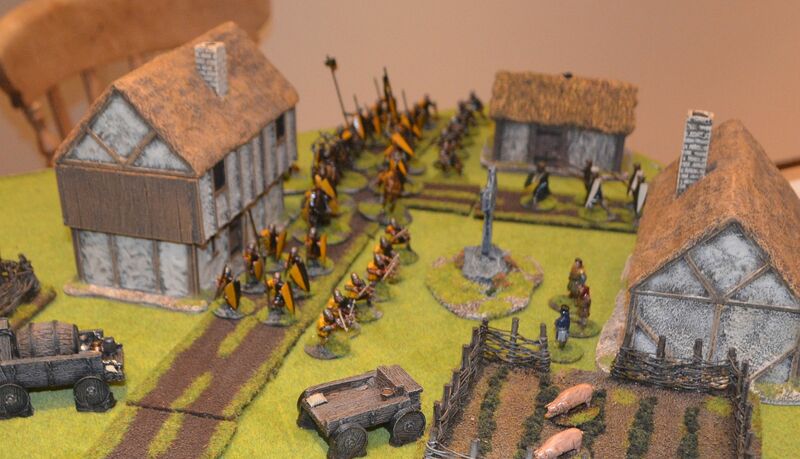 I saw that European distribution was being managed by statuesque miniatures. Unfortunately just before Xmas the rules and cards were both reported as out of stock. I contacted the company and with a great demonstration of customer service I was informed another shipment was on the water. 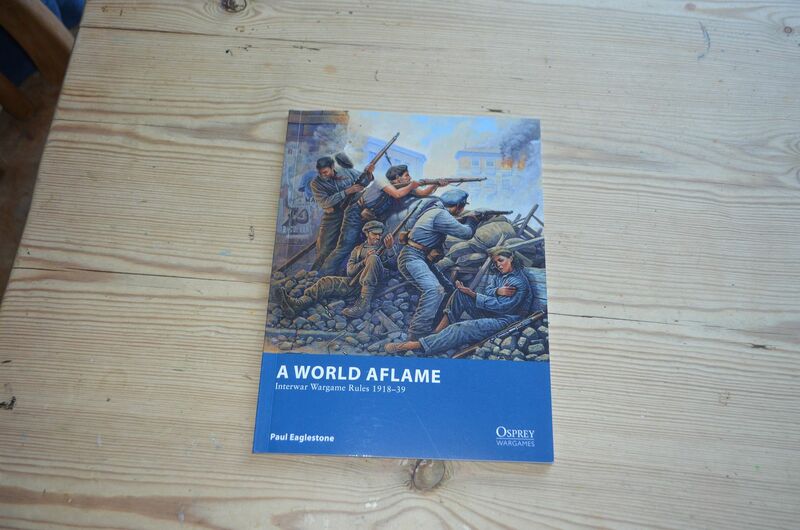 Andrew Rae subsequently emailed me when they did arrive and three days later they arrived in the post. 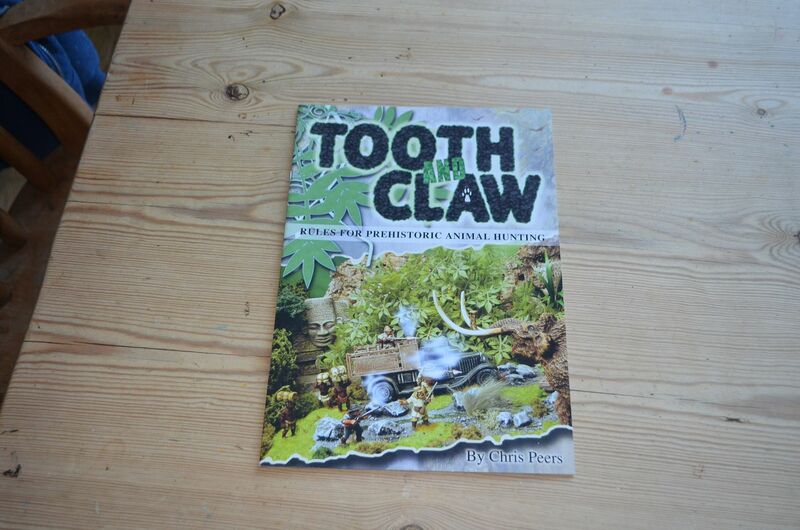 Whilst on the North Star site I found the Chris Peers rules for hunting big game on deal at £5 so this also was ordered. 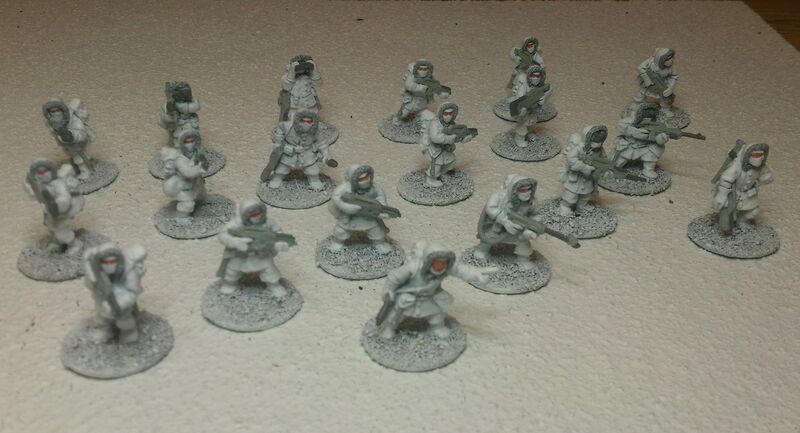 The bases still need to be finished off but at least a few of the these are now painted - I think I might get bored of white by the time this project is finished ! 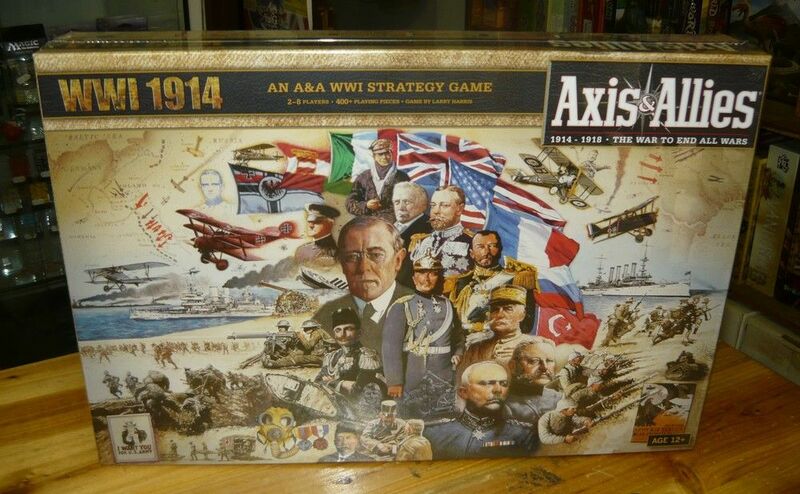 For Christmas I was a very lucky boy as my wife bought m,e the latest Axis & Allies game - 1914 the Great War. I'd read some mixed reviews on this game but suffice to say I thought the premise of such a game was at least worthy of consideration. To sweeten the deal Amazon were running a 20% off deal so the retail came in at about £55. 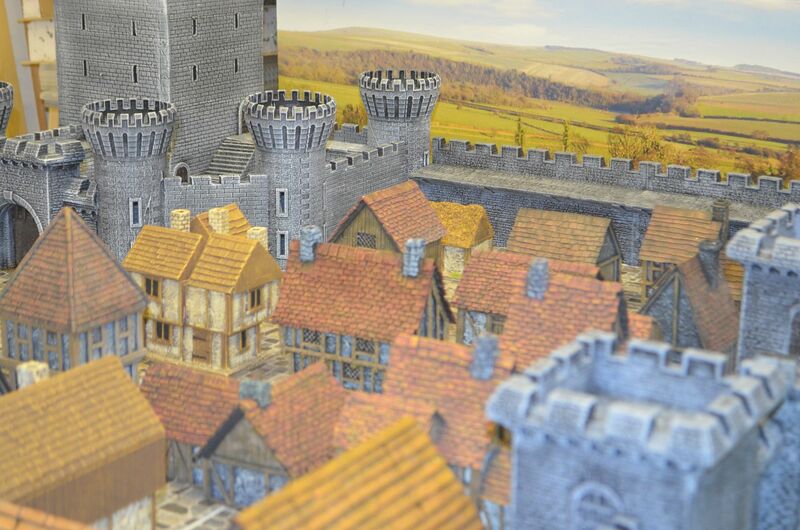 It is a lot of money for a boardgame but when you consider the number of components (over 400) , the hours of play and compared to the latest video game titles it is justifiable. I will in time write up my own review of the game but for those of you familiar with the WW2 variants this should be a straight forward play but the differences have created a game that really does depict the grind and attrition of the great war. The biggest change is that combat is only fought for one round. There are no breakthroughs, blitzes etc. Aircraft support artillery only if you have air supremacy . in as territory and tanks only feature later in the game. From a political point of view Russia could exit the game buy turn 4 (revolution) as America rescinds its neutrality and joins in. The Conflict spreads from Washington to the Urals, From Norway to South Africa. My good friend Mark and I have only played once so far and managed a couple of turns in an evening - albeit our first game and we are looking forward to planning a more longer period of play in the near future. 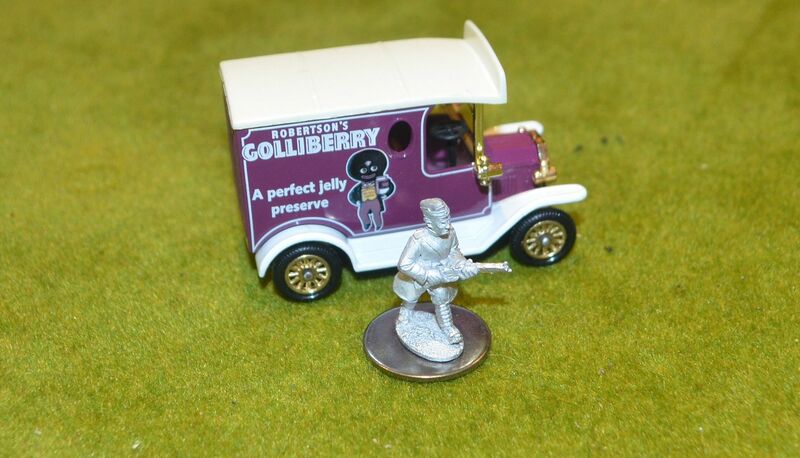 This morning I discovered through the TMP that PMC the company who produce those lovely resin buildings has been acquired by Caliver books. I for one think this is great news. In the past you could only source the resin buildings through ebay and as a result were never certain of actually winning what you wanted. Now there is a real chance of both buying across the range (I see they also sell tanks & boats) at a fair price. 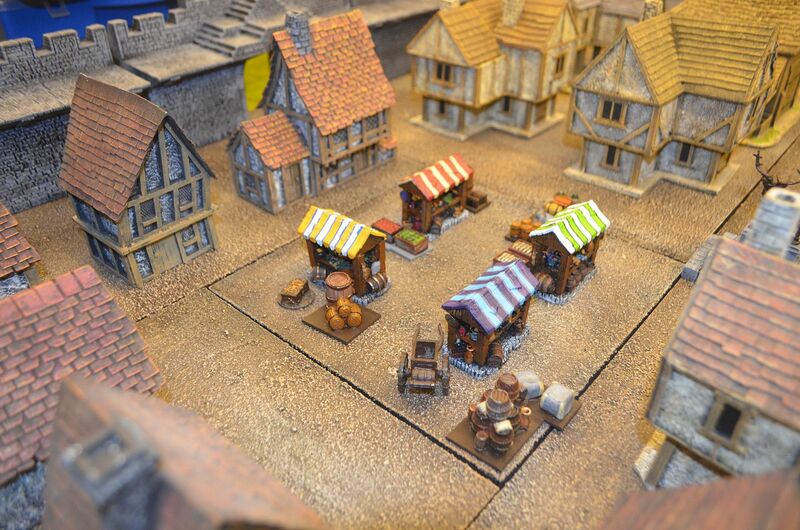 For those of you wondering what I am prattling on about the PMC range contributed heavily to my city of Nottingham build and in my mind are some of the best wargame buildings on the market.